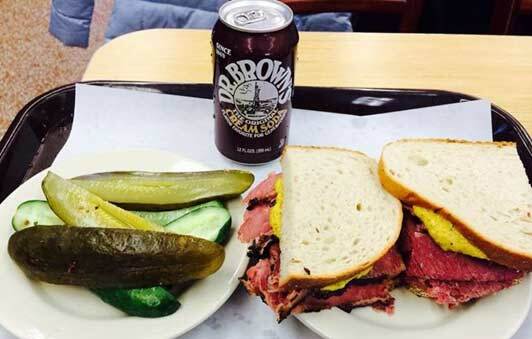 New York City – The Holy Grail of NYC Delicatessens: Katz’s Deli, where grown men and women have been known to unashamedly weep at the first bite of their sandwich. “For me, if I had to pick the one quintessential New York City food experience that elevates to a Heaven-on-Earth moment…it would be a otherworldly Old World pastrami sandwich at Katz’s Deli. Where Harry Met Sally: Katz’s Deli, East Houston Street, Lower East Side of Manhattan, New York City, USA, Earth. Been around since 1888. Now, realize that as a SoCal beach-living, flax/chia seed munching, Kombucha/apple cider vinegar swilling, highly evolved spiritual being of Universal light and Eternal Zen interplanetary love, I don’t EVER eat pastrami, corned beef and the like. But there I was. The Angels called me to the Temple of my Jewish ancestors who came before me. Like I said, sometimes the journey chooses us. I could offer no resistance. At Katz’s Deli, they make these meats with the kind of attention and passion equal to the first kiss shared by Anthony and Cleopatra. To all my beloved vegetarian and vegan friends…I gotta tell ya. This ain’t tofu. I’m weak in the knees. And to top it off, Katz’s Deli is where Meg Ryan had her famous fake O. I don’t smoke, but after this sandwich I needed a cigarette. After a deli sandwich I just had to have some dessert. (Just in case you’re wondering, there is a Newtonian law of nutritional physics that states: The net weight gain or loss of a NYC trip is directly proportional to the calories consumed divided by the total number of city blocks walked.) I walked a lot! I broke even on the weight thing. 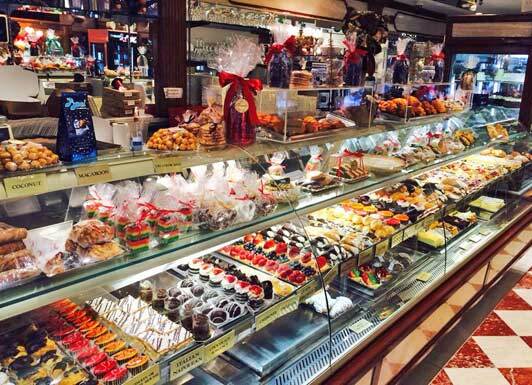 One word: Ferrara’s. Little Italy. Mulberry Street, New York City. 1932. They know what they’re doing. 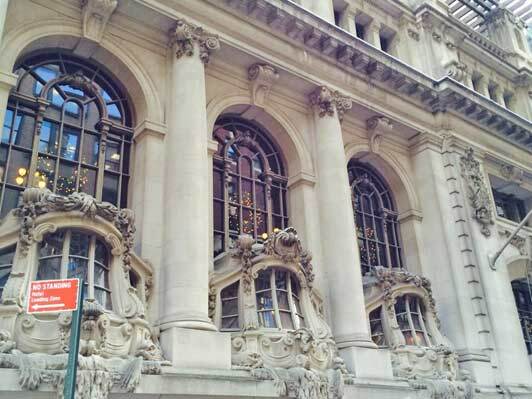 Iconic buildings are important: The Empire State and Chrysler buildings, libraries, museums, corporate tributes to power. New York City has so many. The one and only Brooklyn Bridge. 1883. Steel, wires. C’mon, location. Perhaps music and movies and art were designed to find ways to extol praise on structures like this. But the bridge means so much more. It was a gateway (literally) for the underclass in Brooklyn to know there was hope to move out and move up to the big city. Of all the angles possible, this one is the Woody Allen/Manhattan one. Truly a wondrous moment for me. The Brooklyn Bridge and The Freedom Tower from Brooklyn Heights. Tell me that’s not a “wow.” Cause it is. After two hours in the bitter cold waiting for perfect lighting, I clicked this shot. Again, I was simply drawn to this image. Gravitational. Inspiring. With all that our country faces in the way of terror threats, and with so many good men and good women who have sacrificed their lives to allow us to be free, there is a certain knowing glow about this new symbol. After I took this shot I stood still and reflected. I gave thanks. The River Cafe, a remarkable dining experience. 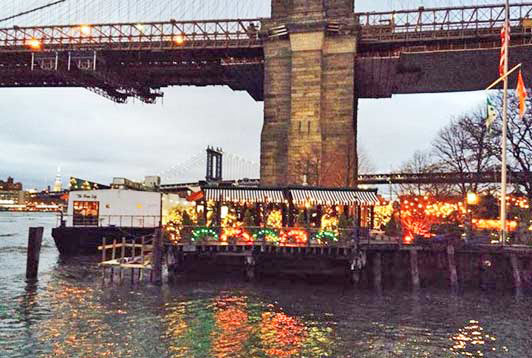 The restaurant sits on a barge under the Brooklyn Bridge. The River Cafe on Water Street in Brooklyn, practically adjacent to the Brooklyn Bridge, is a bucket list dining experience. It doesn’t matter what you order. It’s all great. 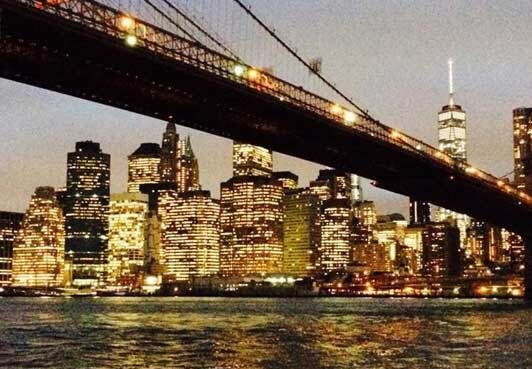 What’s so special is you’re having an IMAX moment with the skyline of Lower Manhattan throughout your meal. This image will stay with you forever. It has for me. Grimaldi’s Pizza. Downtown Brooklyn. 1902. Coal Brick Oven Pizza. In West Side Story, Tony whispers “Maria. Maria. Say it soft and it’s almost like praying.” That my friends is how I feel about the original Grimaldi’s. The finest real Buffalo mozzarella, the freshest hand-picked tomatoes, imported spices, and, here goes this Jewish guy assuming the “genuflect position,” coal fired pizza crust. As they say in Brooklyn, “I gotya holy grail, rightchere, I gotya holy grail.” And you know what? They’re right. The New York Yacht Club. Love the seaweed dripping from the window of this ship…..uh-building. New York City has a lot of wealthy folks. They have built cathedrals to their wealth. Harvard Club. Princeton Club. The New York Yacht Club. They have wealthy folks’ hobbies like yacht racing. Well, you would too if you could. They build buildings to congratulate themselves on having amassed great wealth and corresponding great tans. New York City shoeshine guys. Whenever and wherever I travel there is ultimately one memory above all others that counts. It’s the folks I meet along the journey. On this New York trip, it’s two guys shining shoes at the foot of Grand Central Station. John and Charles. Forty years at your service. Heard every story. They told me they know how a man thinks, how a man feels, about a man’s passions just by his leather. Just look at these guys. They’re the soul of this great city. Hard working men. Put in their time. Give an honest shine at a fair price. John and Charles. Could be Tom or Sally or Eloise. Just good people, all tryin’ to get by. 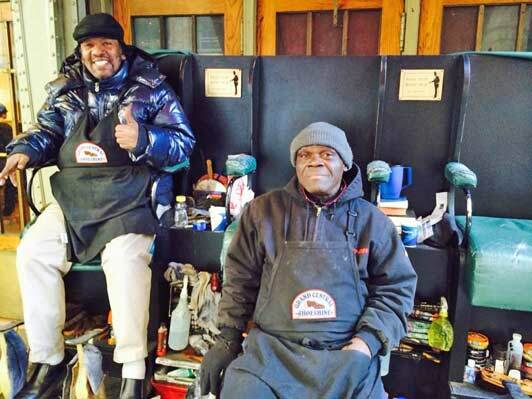 When was the last time you got a shoeshine and two hugs at no extra charge? Merry Christmas gents. This is exactly how I felt on my entire trip. I find it interesting during my travels that because I slow it all down, I am greeted warmly and make long-lasting friends. Kind of a reflex now but expressing genuine interest in even the small details of a person’s life goes a long way. Especially in New York where you could never do it all anyway. Gotham City, thank you. So as I gently loosen the bow and unwrap my gift that is New York I am left to ponder the meaning of my trip back home. Thomas Wolfe wrote that we could never go home again. Surely every time we experience someone or someplace it is through different eyes. Such is the wonder of life. But as we reflect on our childhood home or favorite place in our lives, perhaps we owe it to ourselves to return. Allow ourselves perspective. Give us a moment to reconnect. See, hear, and feel all that is familiar for the first time again. That little wavy haired boy who, with big, bright eyes dared to dream of places far, far away came home. Spur of the moment. Or was it? 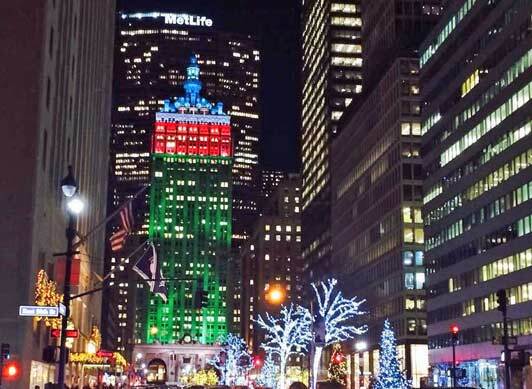 Maybe New York will always be the soulmate in my heart. 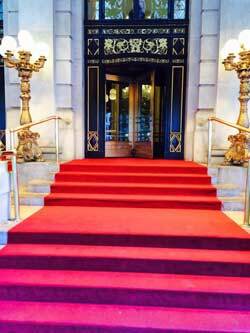 Larry Kessler is a frequent contributor to Authentic Luxury Travel. Be sure to read his previous articles Larry’s Meaning of Life Travel Experience and First Time in Europe – Journey to Connection.